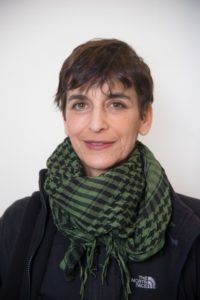 Naomi Goldberg Haas is the founding Artistic Director of Dances For A Variable Population, a multi- generational dance company and educational organizations which promotes strong and creative movement for adults of all ages and abilities, with a focus on seniors. They engage community members as both participants and audience members; offering multiple weekly free programs MOVEMENT SPEAKS® and Dances For Seniors in recreation centers in libraries and senior centers in four boroughs of NYC, tuition based classes in dance and fitness; and performance and choreographic opportunities for older professional dance artists. DVP’s site-related performances have been presented in some of New York City’s most iconic public spaces, including The New York Botanical Garden, Times Square, Washington Square Park, and the High Line. DVP has also performed at Jacob’s Pillow Dance Festival, and internationally in Poland and British Columbia. DVP is a member of the National Dance Education Organization and The International Dance Council in UNESCO, Paris. Artistic Director Goldberg Haas has worked in concert dance, theatre, opera and film; performed with Pacific Northwest Ballet; and was recently awarded LMCC’s President’s Award for the Performing Arts and serves of the Age Friendly Media, Arts and Culture Working Group as appointed by the Mayor.